The people who brought you last year’s Turkish IHH ill-fated anti-Israel convoy to Gaza are organizing another one – this time with an airplane. Virulently anti-Israel Bulent Yaldrim, director of the Turkish terrorist-affiliated IHH group, said last week at a monthly event commemorating last year’s Mavi Marmara flotilla to Gaza that preparations are underway in full force for an even bigger one. “We have just one problem,” he said, “and that is the virus called Zionism.” The speech was reported by the Meir Amit Intelligence and Terrorism Information Center (ITIC). Last year’s convoy was said to be intended to break Israel’s maritime blockade on Gaza and deliver supplies. 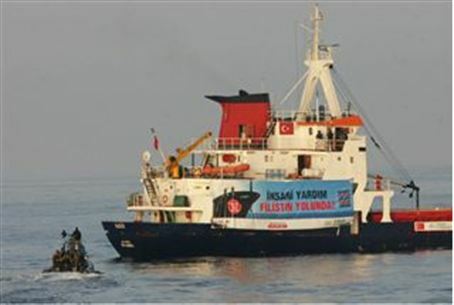 However, the Ministry of Foreign Affairs announced afterwards that that there had been no humanitarian aid aboard the Mavi Marmara. Instead, terrorists armed with “cold” ammunition attacked the IDF soldiers who boarded the ship, abducted at least three of them, and attempted to stab and throw others into the sea. The Israeli forces were able to overcome them and killed nine of the attackers. The IHH, which organized the flotilla, is a member of a group of Muslim charities, the Union of Good, which was designated by the U.S. Treasury Department as a terrorist organization and which was created by and strongly supports the Hamas terrorist organization. The upcoming convoy, to be named Freedom Fleet II, was scheduled to take place around the anniversary of last year’s flotilla, near the end of May. However, Yaldrim said it will probably happen only around late June, partly because he is hoping to purchase an airplane to take part in the anti-Israel convoy campaign. Neither Israel nor the Oslo Accords sanction the landing of airplanes from abroad in Gaza. In his aggressive speech, Yaldrim said, “We are not afraid to die as shahids [martyrs]. We won’t retreat until the blockade from Gaza is removed and until we complete the Al Aksa Mosque journey.” He added that boats are expected from “every country, so that Israel will understand that it does not rule the Mediterranean.” The Mawi Marmara is expected to take part again. The previous flotilla was harmful to Israel in that most news reports highlighted the killing of nine supposed “civil rights activists,” and also worsened already bad relations between Israel and Turkey. In general, it forced Israel to play “catch up” and explain that its blockade was legal, that its soldiers were nearly lynched, and that the bid to bring “humanitarian aid” to Gaza was merely a ploy to put Israel on the defensive.